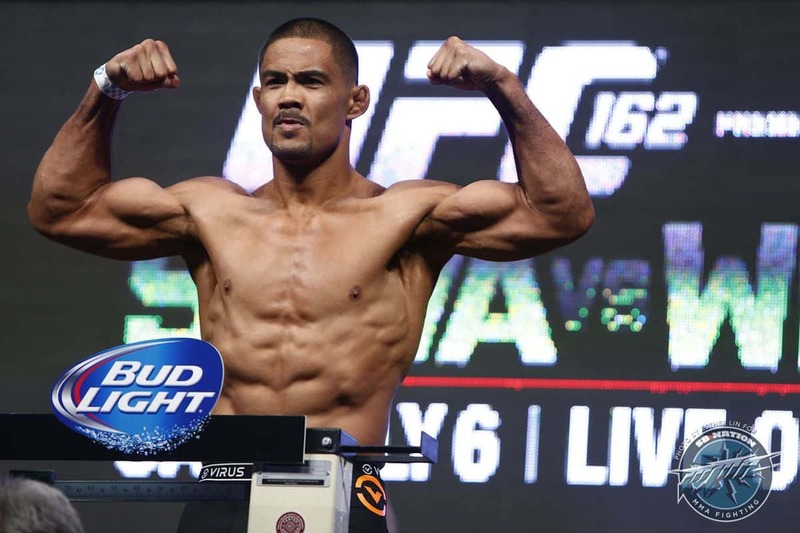 UFC Middleweight Mark Munoz (7-1) enters the biggest fight of his career on a roll. He’s won his last two fights – including an impressive first round stoppage of Ryan Jensen in January – and is likely fighting his toughest opponent to date in Kendall Grove at UFC 112 in Abu Dhabi. Although Munoz is a busy man balancing the demands of family and training for his upcoming fight at UFC 112, he still found time to answer a few questions for us. MMAFullContact.com: You were a national champion wrestler at 197 lbs and have fought previously within MMA at 205 lbs. Your last two fights in the UFC were at Middleweight. Is 185 lbs your ideal fighting weight? Any challenges cutting to that? Munoz: 185 is the ideal weight for me. There really aren’t too many challenges making weight. I do have to watch what I eat. I’ve definitely changed my eating habits. More vegetables, fruits, nuts, lean meats (ie fish and chicken), whole wheat and grain breads, brown rice, etc. Everything that is pretty much easily digestible I eat. With more exercise and training I’m able to keep my walking around weight at 200-205. I’m a Middleweight! MMAFullContact.com: Most of your past opponents would agree that you’re a dangerous combo – a strong wrestler with heavy hands. Is that enough to continue to win in the UFC and progress towards a title shot? Munoz: Having a great wrestling base and heavy hands does help me tremendously, but there are more to MMA than just having those two. I need to have great footwork in my standup to transition into my takedowns or power punches. I also need to incorporate the Muay Thai aspect with kicks, knees, and elbows of the game as well. I’m constantly learning and excited to learn every day. I believe that is what it is all about. I will continue on doing this and if a title shot happens then that is icing on the cake. But I am shooting for the top! MMAFullContact.com: All of your wins are from strikes or went the distance, but you’re also a BJJ purple belt. When are we going to see you pull a slick submission and cash one of those fat UFC Fight Night bonuses? Munoz: I’ve been asking myself the same thing. I do have some slick submissions but haven’t had the opportunity to execute them. Hopefully you’ll see what I’m capable of soon. I would also love that bonus as well! MMAFullContact.com: You have to be pumped – you’re riding a two fight win streak in the UFC and were last seen making pretty quick work of Ryan Jensen at January’s UFC 108. Your wrestling set up the first round stoppage from strikes. Did you expect such a quick fight or that specific outcome? Munoz: I was expecting a 3 round war. I’ve seen Ryan Jensen’s past fights and noticed how tough he was and trained hard to go the whole 3 rounds. To tell you the truth I was surprised beyond belief. But I’ll take it. MMAFullContact.com: Most fighters like to stay busy, and I’m guessing that’s your preference as well, because you’re fighting for the fourth time in the last 13 months at UFC 112. You’re facing an experienced fighter in Kendall Grove and the fight’s in Abu Dhabi. Tough opponent, unfamiliar location – what do you anticipate? Munoz: I anticipate the same, a 3 round war. I’m going to train hard and put myself in bad situations and train my weaknesses all the way up until the fight. This fight is going to bring about fireworks. Kendall is a very active fighter, so am I. We are not going to back down to each other. You are going to see two battle rams colliding on April 10! MMAFullContact.com: Grove is an unconventional opponent because he’s so tall at 6’6″. What unique challenges does that pose for you? Munoz: Standing at 6’6″ he obviously holds the longer reach and will utilize his jab and establish his distance and reach. He is also great on the ground because of his length he’s able to use his leverage in ways most shorter fighters can’t. MMAFullContact.com: Grove recently caught another decorated wrestler (Jake Rosholt) in a triangle after getting dominated for most of their one round fight. What did you learn from watching that fight? Munoz: I learned that when on the ground with Kendall that you must have great posture and position on the ground always. He looks to control posture and capitalize on his length to lock submissions up. I have and will continue to train for all aspects of the triangle, armbar, and umaplata combinations. MMAFullContact.com: Should you come out on top at UFC 112, who do you want to fight next or do you just fight who Joe Silva and your management team agree upon? Munoz: The UFC is known for putting on entertaining cards. I’ll leave that up to them to match me up. MMAFullContact.com: What’s your ultimate goal within MMA? Munoz: To be a world champion! MMAFullContact.com: Mark Munoz – UFC veteran and father of four. What’s tougher? Munoz: What’s tougher? I believe that they are both blessings and will not have it any other way! I believe that with everything there needs to be a balance. In all that I do I list the priorities first. Family, training, gym in that order. I also believe that if you plan your day out and not go through it haphazardly then you will make the most efficient use of your time. This is still a working progress for me but I feel that I’m getting better. I have a lifestyle that is balanced around family, my training, and running my gym. That pretty much takes all my time. MMAFullContact.com: Good luck in your fight in Abu Dhabi. Munoz: Thanks! I’d like to thank Nate Welter from Warrior International, Morgan Smith from Boneheads, Art Decuna from OC Nutrition, and Todd Norman from Cutting Edge Athletic Performance. I also like to thank my training partners Antonio Rodrigo Nogueira, Ryron, Rener, Ralek Gracie, Jason Lambert, Mike Guymon, King Mo Lawal, Jason Miller, Junior Dos Santos, Fabricio Werdum, Daniel Pollaccia, Tom Bunbury, and Renato “Babalu” Sobral. Without these guys beating up on me I wouldn’t be where I am today. Editor’s Note: Looking for more? Be sure to visit the Homepage & Fight Results for Mark Munoz.